Earlier this year adidas Originals kicked off a global campaign with a star-studded TVC that challenged the notion of what it means to be a superstar. The push – one of the largest ever for the Originals brand – celebrates the 45th anniversary of the Superstar, adidas Originals’ most iconic and one of its best-selling shoes. It features Rita Ora, David Beckham, Pharrell Williams and Damian Lillard together in the ad and plays with the idea of self-expression while challenging conventional definitions of superstardom. The campaign sees a number of further collaborations with two of the artists who appear in the advertisement, Pharrell Williams and Rita Ora. The Pharrell drops have seen unprecedented success in South Africa and after the groundbreaking Supercolor release in April, Pharrell is back with the FW15 release of Supershell. As the creator and curator of this fresh new concept, the Supershell Collection sees Pharrell hand-pick friends and creatives from around the world to reinvent the shoe for the very first time. The result is the Superstar shelltoe coming alive with these creatives’ bespoke artwork, joined by six of Pharrell’s very own designs. Along with Pharrell’s, the collection of NYC contemporary designer Todd James and Japanese artist Mr., will be available in South Africa. “Supershell is all about evolving the Superstar shoe into a canvas for creation. It’s the third part of our #OriginalSuperstar campaign and it is aimed at giving those with creative courage the platform to express themselves without being swayed by opinion” says Ricole Green, spokesperson for adidas Originals in South Africa. The result is a powerful documentary style short film titled ‘It’s Not About Us’ which follows the journey of The Sartists, a Johannesburg-based creative collective, who aim to recreate and communicate authentic and untold African stories through fashion and photography. It’s an intimate portrait of three unique characters - Kabelo Kungwane, Wanda Lephoto and Xzavier Zulu – and their shared passion for creativity which is brought to life through the photographic lense of Andile Buka. The film reveals their motivations, fears and dreams as they work tirelessly towards their first ‘big break’ – a collaboration with adidas Originals for the launch of Supershell in South Africa. “The Sartists have been on our radar ever since they showcased their curated vintage suits and leather brogues with the iconic three stripes at one of the very first STR CRD’s in Johannesburg. Their passion for adidas, the product and the brand’s heritage is so inspiring and we’ve been waiting for the right opportunity to work with them. We believe that The Sartists are the perfect translation of the Supershell’s meaning on a local level – giving credit to artists that have developed their personal style in an effort to create for themselves without the need for external validation. They share a consistent trait with the creatives selected for the global Supershell campaign having developed their personal style with a commitment of creating for themselves – a commitment to creating for an audience of one” explains Green. With The Sartists’ personal creative work spaces, the streets of Jozi and their community hangouts as the backdrop, the film captures how Kabelo, Wanda and Xzavier came to meet, where they find their inspiration and how they express their creativity without restriction. The Sartists took their inspiration for their Supershell collaboration from their influences during the kwaito era when artists like Alaska and Trompies, who played a significant role in putting the spotlight on the Pantsula sub-culture in the 1990s, were some of their favourite artists. “Pantsula is an expression of cultural roots for many South Africans – from fashion, to music and dance. We wanted to celebrate it as a strong story of our country’s style heritage. We took that pantsula aesthetic and added them to deconstructed adidas garments to pay tribute to our culture. The collaboration was a natural fit for us. It represents our approach as creatives – we’ve been adidas fans since we were kids and we love the rich heritage it has,” explains Kabelo. Their personal style shines through in the campaign with classic adidas Originals pieces like the Superstar track top and track pants have been transformed into customised pieces with Supershell being the undeniable inspiration. The custom garments include dungarees, one pieces, jumpsuits and bucket hats while some of the pieces also reflect iconic barbershop style paintings on the backs of their outfits. In addition to the short film, the collaboration further includes a look book with The Sartists’ final custom creations photographed by Andile Buka, as well as an installation at AREA3 featuring the three artists. The installation was conceptualized by ANDPEOPLE, the activations agency behind the film. 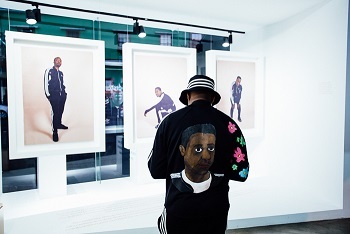 The collaboration between adidas Originals and The Sartists was recently launched and celebrated at an exclusive event at AREA3 located in Braamfontein, a suburb regarded as the epicenter of South Africa’s growing street style culture. Visit www.adidas.com/originalsuperstar for more information. Follow adidas South Africa on Twitter (@adidasZA) and Instagram (adidasZA) or join a conversation with The Sartists by using #superstar #supershell and #adidasOriginals.